Every year when Thanksgiving is coming around the corner, we might think of the tasty pumpkin pie. How wonderful it would be when this traditional Thanksgiving dessert is served after an enjoyable Thanksgiving dinner. Quite often, I feel a bit weird of living down under here, while Thanksgiving and Christmas are coming closer, but the weather getting hotter and hotter. Sometimes It comes to the point that I don’t want to turn on the stove, let alone the oven. Being a home cook, I feel the hot weather is a hindrance to enjoy cooking. Here come these cute pumpkin mochi cakes served perfectly in such a situation, but when I'm still craving some warm pumpkin dessert. Best of all, the dessert can be finished within half an hour, and help my family to feel the atmosphere of Thanksgiving. But for this year, I and my family would experience an extremely special Thanksgiving. We will travel on that day overseas. The whole family will be enjoying the company of each other in Tokyo, Japan for a week. Yay! Happy Thanksgiving to all of you! Enjoy every moment of being with your loved ones! Sure, I’ll moderate and respond to your comments whenever I have access to internet during the stay in Japan. Sprinkle water over the pumpkin, covered and cook in a microwave oven at high power for 4 minutes, or until softened and cooked. Or you might like to steam the pumpkin in a wok for 20 minutes. When the pumpkin is still hot, immediately stir in sugar. Press and stir hard until sugar dissolves completely. This is the sweet pumpkin puree you need. If you steam the pumpkin, use the same method of mixing sugar and make pumpkin puree. 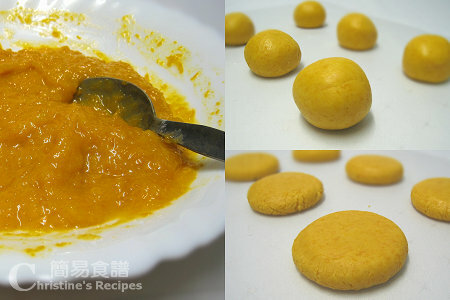 Stir in one-third of the glutinous rice flour and combine thoroughly when the puree is still warm. Incorporate the rest, with a small amount at a time until you get a smooth, non-stick pumpkin dough. Roll the dough on a clean surface, sprinkle extra flour if it's too wet or sticky. Cut into 6 equal portions, each about 40 to 42 grams, and shape into little balls. Press with the bottom of a cup to shape a flat disc. Heat some oil in a non-stick frypan. 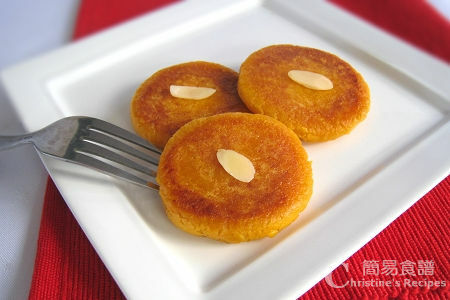 Place pumpkin cakes in a single layer and fry both sides over medium-low heat until golden brown, about 5 to 7 minutes. Cut a bit to taste. There should not be any raw flour taste when they are cooked through. Serve hot on a platter. Decorate them with roasted almonds if desired. When rolling the pumpkin dough, you can add more glutinous rice flour if you feel too wet, or vice versa add more water when it’s too dry. You might like to put cooked pumpkin with sugar into a food processor and get smoother puree within a few seconds. If you use steaming method, the dough would be a bit wetter than those cooked by microwave oven. Don’t discard any water in plate, combine with sugar as well. Happy Thanksgiving to you too! Enjoy Japan! Lovely dessert/snack. Have a great trip. How lovely! The colour of these mochi mini cakes is so tempting! They look appealing, a bit like 'Farn Shu Tan', deep fried sweet potato balls? I recently learned about mochi. I want to make this recipe! Thanks! Looks great! Have a nice holiday! I'm always intimidated to make dessert with glutinous rice flour, just scare of making it too plastic-like! But there are too many wonderful and tasty recipes out there which really got me very itchy! And I love MOCHI!!!!! Your mochi cake looks wonderful. Very lovely pumpkin desserts. I would love them very much. Have a wonderful time in Japan. The mochi cake sounds really interesting! Btw, do enjoy your trip with your family.Cheers. I like the look of this very much! Enjoy your trip sweetie. lovely snack! have fun on your trip! Beautiful recipe -- I've had mochi plenty of times, but not with pumpkin. Perfect flavor idea! Your pumpkin mochi is really cool! Mochi = pumpkin - this sounds awesome, I cannot wait to try this, wow my family. They will be so impressed, and I'll have you to thank. What a festive dish! I have never tasted or made it!! But now I will! Thanks for this interesting recipe! I'm a huge fan of mochi and the pumpkin is an added bonus. If you have any cookie recipes that are this creative I'd love to have you consider participating in Gourmet Girl Magazine's Virtual Cookie Crawl. I can't wait to try to these at home. Thanks so much for your comments and greetings. Unfortunately, I've just found that many comments left by readers didn't display at all. Many bloggers were experiencing the same problem in the past few days. In the meantime, I have to wait for the solution of Google Blogger. I'm going to try this, thanks..
Hi i really want to try this recipe but peeling pumpkin has always been a problem for me since the skin is so tough. Do you have any tips on removing the skin? I've tried soaking it in water but that doesn't really help. Some of my friends said that they eat the skin as well. ahh cutting it into tiny chunks just might work! you're so quick at replying, I'm not even done browsing your other amazing recipes :) Thanks a bunch! Mmmm, that looks delicious! That might be a silly question (I'm just learning how to cook ^^;;) but would kabocha work just as well if I don't have pumpkin? Aw, I think kabocha would even taste better. Hi!! Looove ur site. Beautiful pix n recipes. Canni replace with sweet potatoes? I haven't tried. But I think it works with sweet potatoes too. Can I use can pumpkin puree?